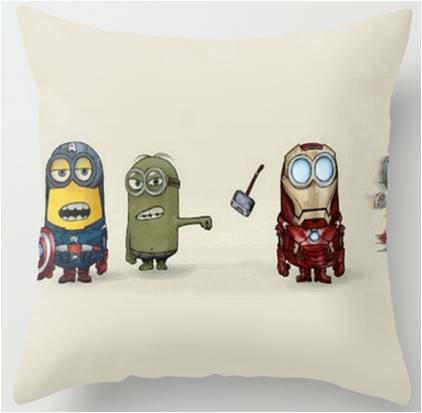 This unique artisan design 16×16-inch Despicable Me Minions pillow provides a glimpse of what the Marvel Avengers might look like as those impulsive yellow cylindrical creatures with little self-control. The artist has costumed Minions as Captain America, The Hulk, and Iron Man with Thor’s hammer flung from the side in a design that suggests the mischief you would expect from Gru’s henchmen. This is a two sided design with the same images on both sides. Colors in shades of yellow, red, blue, green, gray, black and gold stand out on a soft sandy colored background making this an accessory that complements the Despicable Me themed decor. This throw pillow comes with a washable, removable cover and a hypoallergenic, down alternative pillow insert. The insert is double stitched for quality and overfilled for comfort. The cover on this Avengers themed throw pillow is made from 100 percent spun polyester poplin fabric and has a concealed, durable nylon zipper for easy removal when cleaning. Inside is a plain white high quality, down alternative that is hypo-allergenic. To clean, pre-treat any stained or soiled areas with a color-safe spot cleaner or spray or use a damp sponge to remove stains. This Minions cover is machine washable in cold or warm water using a mild detergent but bleach should be avoided. Bleach will cause fabric fibers to degrade and may turn the fabric yellow. Tumble dry on a low setting or allow the pillow to air dry for best results. Because this is an artisan design, this pillow is not available in any big box retailer and is only available for purchase online. It has been signed by the artist. Pillows are made to order in the USA and are available to ship to buyers in just 3 to 5 business days. It is available in 16×16-inch, 18×18-inch and 20×20-inch sizes and WITH or WITHOUT the pillow insert. Order this as a PILLOW COVER only if you have an existing throw pillow, in one of the above sizes, that can use a fresh hilarious new look. The spun polyester poplin fabric is also available in an INDOOR or OUTDOOR option. The outdoor option costs a few dollars more. You may also order this unique design as an iPhone or iPad case, coffee mug, tote bag, wall clock plus other options through the link below. Pricing has not been determined by this website and will be based on the Despicable Me merchandise you select.